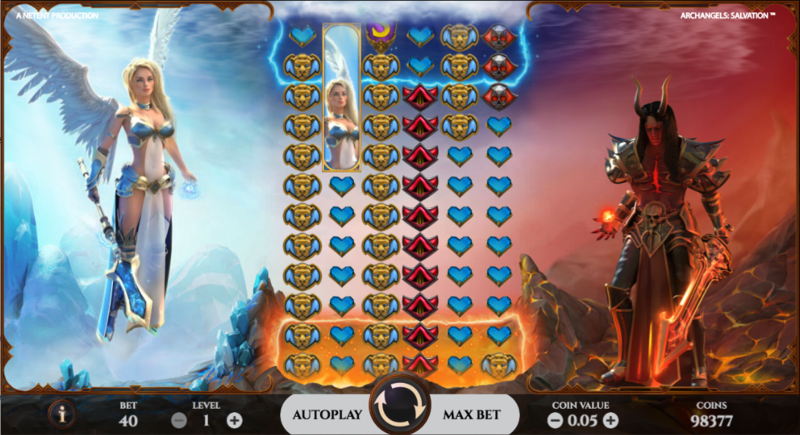 The battle between good and evil has popped up once or twice as the theme for online slot machines and here we have one more in the shape of Archangels: Salvation; it’s Net Ent’s first game to feature one hundred paylines and it comes with a variety of bonus features. As you can see from the screenshot above, Archangels: Salvation is a six reel slot with twelve rows and one hundred paylines; stacked symbols are the order of the day along with hotspots at the top and bottom of the reels which we’ll explain shortly. Representatives of heaven and hell (no prizes for guessing which is which) watch over proceedings from either side of the reels. The higher value symbols include our two characters from the afterlife, a golden helmet, a golden lion, some red horns and a red-eyed skull; crystallised playing card symbols make up the lower values. 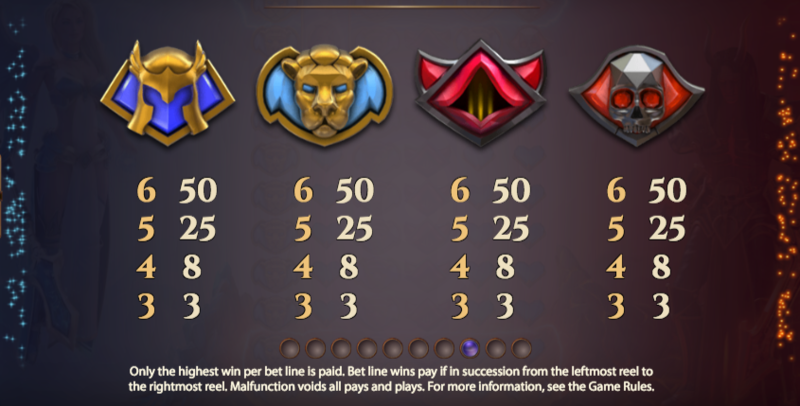 In the base game the wild is a 2×2 gold ‘W’ and it will substitute for all others to help form winning combinations except for the big ‘S’ scatter symbol. If a wild symbol or part of a stack land in the Hot Spots during this round the feature will be retriggered with four extra single wilds or one extra stack respectively. This is triggered by landing three, four, five or six of the big ‘S’ scatter symbols anywhere in view for which you will receive 10, 15, 20 or 25 free spins respectively. It’s not possible to trigger any more spins from within this round but the Hot Spot areas increase to three rows to make it easier to activate the Hot Spots Bonus. Archangels: Salvation is a very well-designed slot with some great graphics and an array of bonus features which should keep most players busy; those features can be a little hard to come by but they’re profitable when they do. This game comes with an RTP of 96.08%.